Jaipur is affectionately referred to as the Pink City because of the pinkish color of its Old City. The city, which is surrounded by rugged hills and besieged walls, is full of fascinating royal heritage and evocative well-preserved buildings. As well as being Rajasthan's capital, Jaipur is part of India's famous Golden Triangle Tourist Circuit. This makes it one of the busiest and most iconic cities in the state. In recent years, Jaipur has evolved to become quite hip with lots of cool cafes, shops, and artist spaces opening up. Plan your trip there with this Jaipur information and city guide. Jaipur was built by Sawai Jai Singh II, a Rajput king who ruled from 1699 to 1744. In 1727, he decided it was necessary to shift from Amber Fort to a place with more space and better facilities. Jaipur is actually India's first planned city, and the king put great effort into its construction. He recruited Bengali architect Vidyadhar Bhattacharya to design it according to the principles of Vastu Shastra (the Indian version of Feng Shui). The Old City was laid out in a rectangle shape of nine blocks. State buildings and palaces occupied two of these blocks, while the remaining seven were allocated to the public. As for why the city was painted pink -- it was to welcome the Prince of Wales when he visited in 1876! Local laws require the color to be maintained, so the painting continues. Jaipur is approximately 260 kilometers (160 miles) southwest of Delhi. Travel time is about four hours. Jaipur is also about four hours from Agra in Uttar Pradesh. Jaipur is well-connected to the rest of India. It has a domestic airport with frequent flights to and from Delhi, and other major cities. Indian Railways "super fast" train services operate along the route and it's possible to reach Jaipur in under five hours from Delhi. Here are the best trains from Delhi to Jaipur. The bus is another option, and you'll find services to and from many destinations. A useful website for checking out bus timetables is that of the Rajasthan State Road Transport Corporation. UTC (Coordinated Universal Time) +5.5 hours. Jaipur does not have Daylight Saving Time. 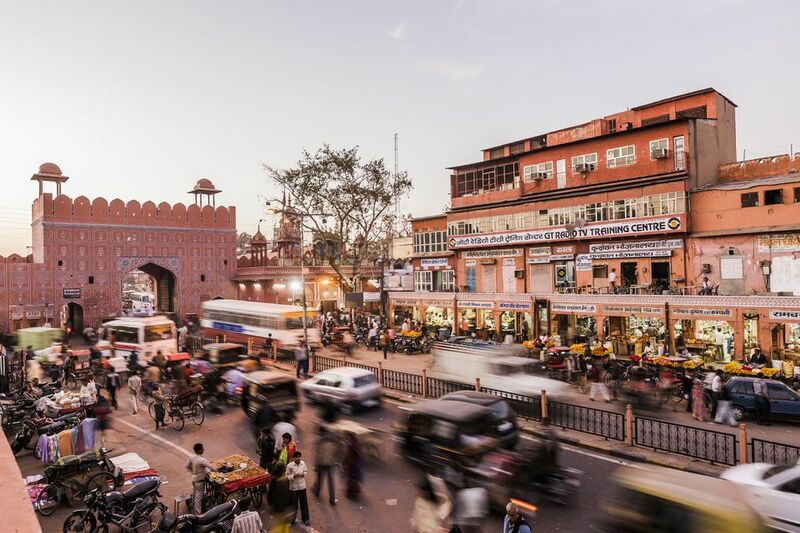 Just over 3 million people live in Jaipur. Jaipur has a very hot and dry desert climate. During the summer months from April to June, temperatures rise to 40 degrees Celsius (104 degrees Fahrenheit) or more. Monsoon rain is received, mostly in July and August. However, daytime temperatures still remain above 30 degrees Celsius (86 degrees Fahrenheit). The most pleasant time to visit Jaipur is during the winter, from November until March. Winter temperatures average 25 degrees Celsius (77 degrees Fahrenheit). Nights can be very chilly though, with temperatures dropping to 5 degrees Celsius (41 degrees Fahrenheit) in January. There's a prepaid taxi counter at Jaipur airport, and prepaid auto rickshaw counter at the railway station. Popular app-based cab services Uber and Ola operate in Jaipur, and provide a convenient way of getting around. It's possible to book an Uber for all-day sightseeing (select HIREX or HIREGO on the app). V Care Tours is also a reliable company for hiring a car and driver in Jaipur and Rajasthan. Alternatively, take a Pink Auto Rickshaw (driven by women from poor households) or ride a Segway to go sightseeing. Auto rickshaws are plentiful in Jaipur but they rarely agree to go by the meter. So, be prepared to haggle to get a decent price. The numerous forts and palaces are among Jaipur's top attractions. They have stunning views and elaborate architecture. Start by going on a self-guided walking tour of the Old City. or join one of the immersive heritage walking tours conducted by Vedic Walks. Adventurous travelers will enjoy a hot air balloon flight over Jaipur. Check out these recommended places to go shopping in Jaipur if you want to splash some cash. There are also a couple of old step wells near Jaipur with interesting architecture to see. If you're in Jaipur in late January, don't miss attending the annual Jaipur Literature Festival. Those who are interested in taking an arts and crafts workshop or cooking class will find that Jaipur Diaries has plenty to offer. The workshops are all held at Arya Niwas heritage hotel. To watch a Bollywood movie, head to Art Deco Raj Mandir cinema near MI Road. Relax with a cocktail or gin and tonic at chic Bar Palladio at the Narain Niwas Palace Hotel, with interiors by Dutch designer Marie-Anne Oudejans. Italian cuisine is served there too. Tapri the Tea House, one of the best places to drink tea in India, is where roadside chai meets hipster hangout. You'll be able to drink India's iconic drink in a cool, clean environment. To sample some local street food, head to Masala Chowk -- the first-of-its-kind open-air food court with an assortment of street food stalls in Jaipur. It's situated in Ram Niwas Garden, close to Albert Hall Museum, and is open daily from around 10 a.m. to 10 p.m. There's an entry fee of 10 rupees per person. If your budget can manage it, have a meal at the Taj Rambag Palace's stunning Indian restaurant Suvarna Mahal (the original palace dining room). It serves up authentic royal cuisine from Rajasthan, Awadh, Punjab and Hyderabad. Jaipur has an outstanding range of accommodations for all budgets, ranging from luxurious authentic palace hotels to sociable backpacker hostels. In terms of location, the peaceful Bani Park and Hathroi Fort residential neighborhoods are conveniently central to Jaipur's railway station and the Old City. Choose from this pick of top hotels, guesthouses and hostels in Jaipur. For longer-term stays of a month or more, Om Niwas in Bani Park has one-bedroom apartments with kitchens. The Shekhawati Region of Rajasthan is only three hours drive from Jaipur and is often referred to as the world's largest open air art gallery. It's renowned for its old havelis (mansions), with walls adorned with intricate painted frescoes. Most people overlook visiting this region in favor of more popular places in Rajasthan, which is a shame. However, it means its delightfully free of tourists. Jaipur is a much visited tourist destination, and where there are tourists, there are scams. You're guaranteed to be approached on numerous occasions. However, the most common scam which all visitors should be aware of is the gem scam. It comes in various guises but the important thing to remember is under no circumstances should you purchase gemstones from someone who approaches you to do so, or enter into a business deal, no matter how much you think it may be in your favor to do so. Scams involving auto rickshaw drivers are also common in Jaipur. If you arrive by train, be prepared to be surrounded by them, all vying to take you to a hotel of their choice where they will get a commission. You can avoid this by going to the prepaid auto rickshaw counter at the station. The constant summer heat is very draining, so it's important to take measures to avoid getting dehydrated if you visit during the hottest months. Make sure you drink plenty of water and avoid staying out in the direct sun for too long. As always in India, it's important not to drink the water in Jaipur. Instead buy readily available and inexpensive bottled water to stay healthy. In addition, it's a good idea to visit your doctor or travel clinic well in advance of your departure date to ensure that you receive all the necessary immunizations and medications, especially in relation to illnesses such as malaria and hepatitis.